Not the Thames! 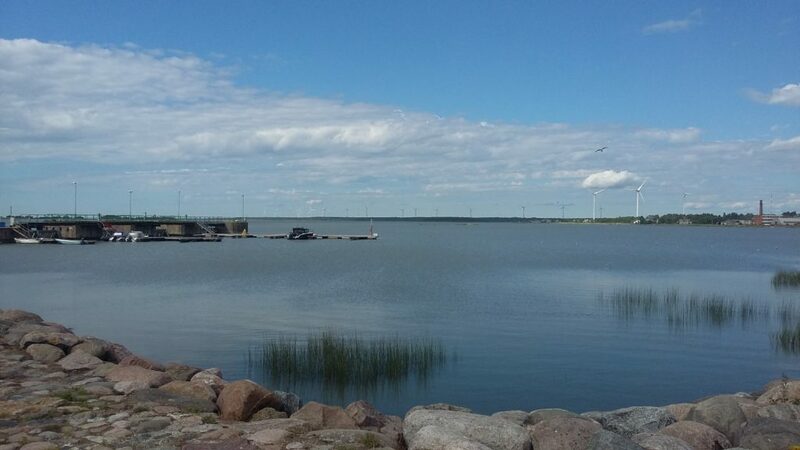 Taken from the ferry terminal before crossing to Muhu Island. Last time, I talked about how I was setting out to find my poetry head again and I’m glad to report that it’s working. I took a complete break from everything for a week – unplanned but definitely needed. We have been to Estonia for a long weekend for a friend’s wedding and the books and notebook I packed remained unopened for the duration. I did read hiking and trail running magazines, and made plans for at least seven trips. I spent hours wandering around the island where the wedding was held, just soaking up the blue skies and wildflowers. Once home, I took a further two days off, mostly watching tennis, until I finally felt my head clear and I was eager to get back into things, rather than having to drag myself to my desk. I remind myself that I don’t have to write, that I don’t mind it being hard work but I don’t need to be miserable doing it. I’m glad to have been through this cycle a couple of times before (and no doubt will again) and so I know what to do and that the joy will always return. So, I’ve been reading poetry again, and thinking critically about what I’m reading. I managed yesterday to pin down why I like Elizabeth Bishop – usually it’s quite clear to me why I am drawn to a particular poet, but in this case I have been unclear, to the point of being able to point out far more things I didn’t like about her poems. And yet, I kept going back. Finally I just started writing things down and the mystery unravelled. I often forget to do that, and yet it’s something that works for me completely reliably if I want to get my thoughts in order about something. Bishop writes about ordinary people and places. Neighbours, workers and children, ordinary coastlines and backyards and buses. The way she writes, with such exquisite focus, lends importance to these ordinary things – and I also think ordinary things are important. I’m not drawn to poems about famous or grand people or things, or glorious sunsets or landscapes, I don’t want to write about those things myself. So I relate to Bishop and see things in her writing that I want to emulate. Today I’ve been working on a sequence of poems I plan to send off to a friend for feedback (if only the printer hadn’t run out of ink), and once I’ve finished this post I’ll sit down with the journal I didn’t open on my holiday: Modern Poetry in Translation. This year I’ve been deliberately expanding my reading well beyond British shores as I was starting to feel a bit weighed down by the English canon, which can at times feel a bit samey. So I see MPT as an important read. I’ve also started reading more North American poets – Anne Carson in particular who I am currently in love with – and I discovered Zeina Hasham Beck at a reading I went to last month, do get hold of her latest book, it’s amazing. If you have any recommendations for other great non-English poets, living or not, then please do leave a comment and tell me! Oh I have so much love for Elizabeth Bishop! ? I’m really not a poetry person (for a literature grad I have extremely plebeian tastes) but Bishop, yes, always. It’s the needle-sharp focus, as you say; everyday situations, everyday language, but so exact and specific and powerful.